We have been extremely fortunate to have a beautiful new library which was opened in October 2017 and which became fully operational in January 2018. The building was made possible by the tireless fund-raising efforts of our PTA and the generosity of our parents. In the past, our library was housed first in 2 classrooms and then in a venue which was originally earmarked as an activity centre. 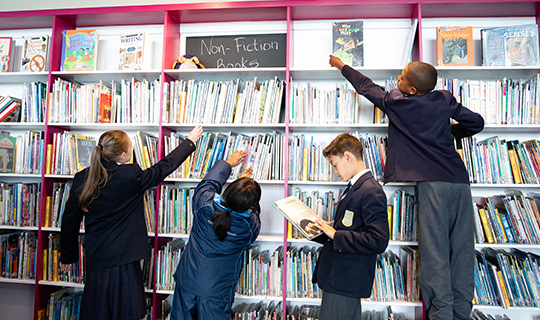 Our new spacious library offers a Foundation Phase section, an Intermediate Phase Fiction and a Non-Fiction area, as well as an upstairs teaching space called the Literacy Lab. Fiction shelves can be wheeled away to clear the main area of the library, making it a multi-purpose space. Classes visit the Library once a week. Foundation Phase children enjoy a story or related activity before choosing a book to take home for the week. Intermediate Phase children take out books once a fortnight and spend the weeks in between, exploring different aspects of literature, writing and communication in the Literacy Lab. Lessons are geared at empowering them to use the library effectively, develop a love for reading and to develop the skills necessary to read with understanding. Children are encouraged to visit the library before and after school, as well as during breaks. Besides reading, there are games to play and places to do homework or study. Informative displays are put up on the windows and walls to encourage them to engage with a variety of texts. “Read it Jars” provide a place to recommend books to peers and the “Brand new books” shelf always attracts keen readers who want to be the first to take out a new book! The library is a bright and busy space filled with light and colour. Our resident school cat, Smokey, spends a lot of time in the sunbeams or on his favourite chair and helps to give it a homely feel, making children, teachers and visitors feel very welcome.